Part marketing compass, part demographic indicator; how manga is packaged can often tell you more than any press release ever will. 2007 in particular began with an overhaul of manga ratings systems, particularly on the part of Tokyopop, and rightfully so--many of TP's age estimations were [and still remain] laughably off the mark. Age rating revisions on the part of most publishers also act as a sort of fallback in controversial times; the world has seen enough young-child-violent-manga-shocked-parents stories to know that companies can always point to the ratings and cry "it's marked 13+!" Cover design--and imprints bearing specified cover designs--are all the rage, and Viz in particular is taking this strategy to town. Viz ports all books under it's Shoujo Beat imprint into a design template; clear markings on the front, side and a specific back layout in the case of Shojo Beat are designed to guide female readers to other series under the same label that might appeal to them as well. Although many pubs lean on an imprint system to pull certain demographics to other works, nowhere is the lean stronger than Viz. 2007 saw the advent of its "Signature" and "Viz Media" imprints. Viz Media functions as a catch-all imprint for books with a shounen or seinen bent, particularly for anything that stands in opposition to the elements of their Shonen Jump imprint. Signature, on the other hand, skews towards an older demographic, with Viz funneling most of its new horror titles into it and editor Urian Brown touting it as "manga for smart people." It follows then that Signature's cover designs are the most ambitious and abstract; Signature is moving in on Vertical territory, particularly by picking up older or more adult-oriented titles and then wrapping them in older, more adult-oriented design. Vertical has mastered the art of selling the old like it's new; find an old title that's both intellectually stimulating and "classic," wrap it in some Chip Kidd-designed semi-abstract eye candy, and sell it like the hipster cool you wish it was. It's a brilliant formula, with adults able to gravitate towards titles that appear a little more subdued, a little less 12-13 age demographic, sometimes even in a larger and/or hardcover format a la Drawn and Quarterly's gekiga titles Abandon the Old in Tokyo, and The Push Man and Other Stories. Cover redesign also functions to hide the retro nature of the titles, masking what would otherwise appear to be old school art in new age design. Of course, how companies choose to redesign their product indicates tailoring for a specific group of readers or brand name hubris. Tokyopop in particular gains infamy for this; every title in their catalogue features a TP spinebar that spills over to the front and back, garishly eating into the cover art with their logo. To boot, many of TP's cover fonts and symbols are retooled to appear more in line with the title, and often badly at that. In the world of organic manga design, Tokyopop is Cheese Whiz. At the opposite end of the spectrum, publisher Dark Horse messes with very little, treating good design with simple respect and perhaps a little extra financing. 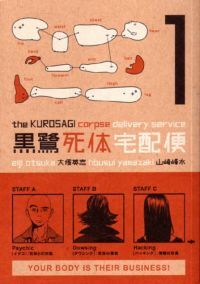 DH's Kurosagi Corpse Delivery Service covers are left relatively unchanged from the way Bunpei Yorifuji first conceived them, aside from translation, and the original brown paper bag feel of the cover paper has been carried over to the English version. As manga editor Carl Horn noted, "You may not miss a good design when it isn't there--but once you see it, you're glad it is there."